Red Eye Gorby, looking pretty fetching in the picture to the upper left, nails it. My first encounter with Indiana Jones and the Temple of Doom was like listening to a radio play. I was too young to watch it, but my brothers weren’t. If you’ve seen Temple of Doom before, you don’t have to ask why my parents didn’t let me watch it. In my room, supposedly falling asleep, my ears could pick up howls and screams of the movie. Whatever was going on for Indiana Jones, it must have been shot on location in Hell. So I began the game, and I know you played it, too. If you’re a kid, there are ways you can get out of an in-room house arrest. You might not have power over your house, but you have tricks to use. The glass of water approach. The school-related question that just couldn’t wait until morning. If you picked a good enough question, you can sneak back out with a follow-up question if you waited at least ten minutes. I also employed the “hallway hover,” where I picked an angle in the shadows where I could see part of the big wooden-cabineted television set. I can’t recommend this method, because I always got caught after a few minutes, and I never had a good alibi when I did. From what I was able to hear and see of Indiana Jones and the Temple of Doom, and what I heard at school, this is the movie I assumed they were watching. Indiana Jones escaped from a nightclub shootout and then, later, he ended up in a big palace where they spent half an hour eating monkey brains and snakes and you just saw close-ups of chewing teeth and nasty flesh. Then, they went into the basement which was filled with giant caves and guys in robes. One robe guy gets his heart pulled out of his chest for real, not like for pretend, and then he’s very slowly roasted alive in slow-motion. After that, Indy turns into Satan but he gets better. Then they get to escape and Indy feeds the bad guy to a crocodile who chews on him, legs first, as blood and guts pop out of his mouth. 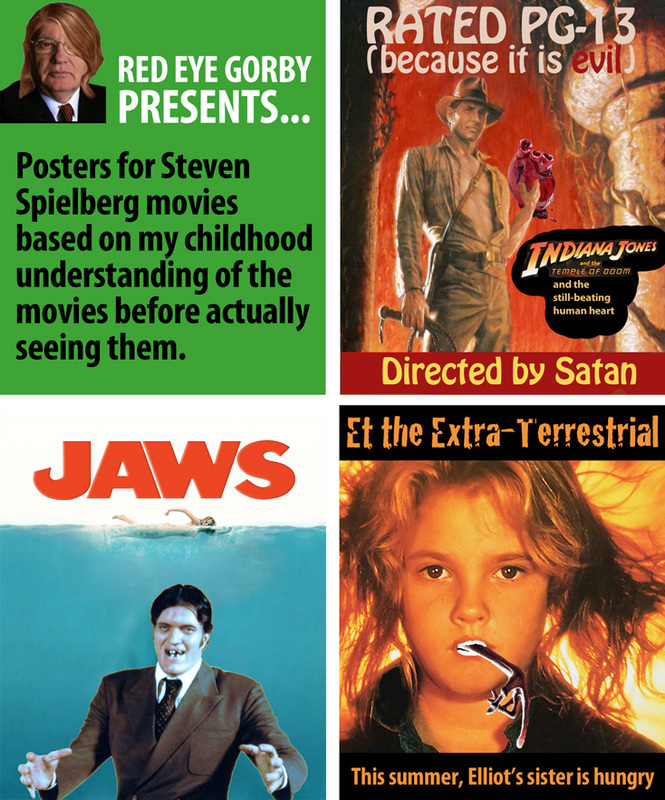 Comic artist Red Eye Gorby produced the image above in commemoration of childhood expectations of grown-up movies. f you can look at it without laughing out loud, you don’t remember the allure of forbidden movies clearly enough. My version of Temple of Doom isn’t the movie you’ll find on DVD today, and it wasn’t the movie I saw when I was finally old enough to watch it on network TV. However, I think you might find it as compelling as I did, imaging it as a child. I should start a Kickstarter project to film this version. Bare Bones of a Scare.